Listes des maquettes FROG sorties entre 1955 et 1976 hors avions et bateaux. F603 1964 Dennis Wadham Ambulance 1/16 FROG ? F600 1964 Jaguar XKE Coupé 1/16 FROG ? F610 1964 Morris 1100 Mk.I Saloon 1/16 FROG ? F042 1965 Austin 1100 Mk.I Saloon 1/25 FROG ? F044 1965 Austin 1100 Princess 1/25 FROG ? F043 1965 MG 1100 Mk.I Saloon 1/25 FROG ? 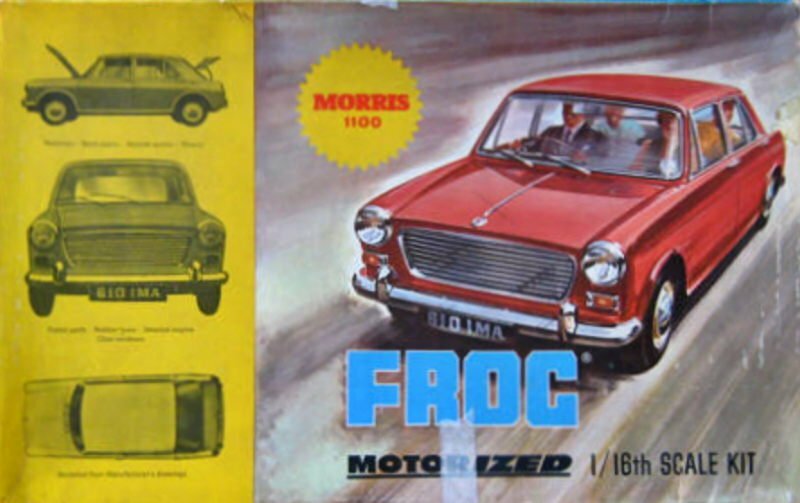 F041 1965 Morris 1100 Mk.I Saloon 1/25 FROG ? F046 1965 Austin Mini 850 Mk.I 1/20 FROG ? F048 1965 Austin Mini Cooper 1/20 FROG ? F045 1965 Morris Mini 850 Mk.I 1/20 FROG ? F047 1965 Morris Mini Cooper 1/20 FROG ? F602 1965 Ford Consul Cortina Mk.I Saloon 1/16 FROG ? F601 1965 Vauxhall Victor FB Estate 1/16 FROG ? 344P 1960 Bloodhound I 1/24 FROG ?